How are you doing?Eid is so very near & when Eid is approaching Shopping is always on our minds.Isnt it!! This nail color is by DAZZ MATAZZ that I believe is a French brand.The name of the color is Wild Orchid & the no. is 28.Lets have a look at it! 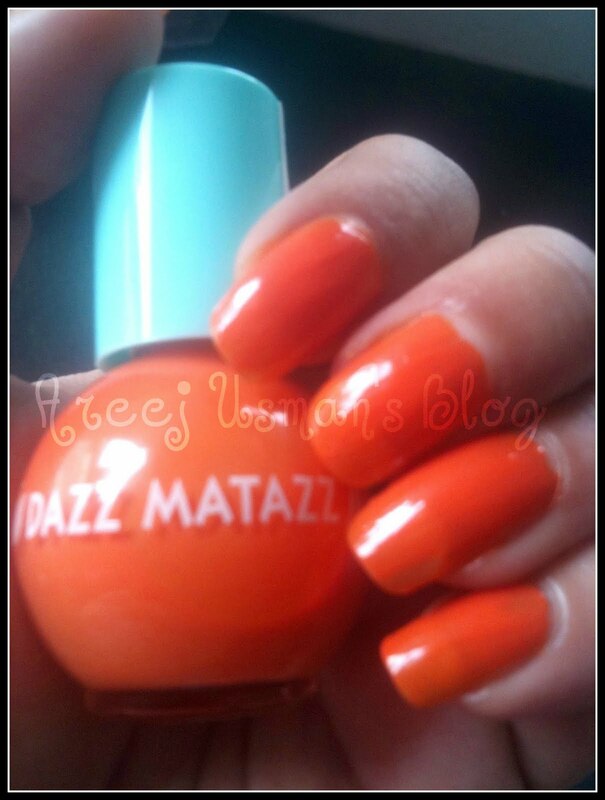 Shiny, superior & extremely glossy long lasting nail wear that lasts for up to 6 days. promises to deliver flawlessly smooth even color to nail. 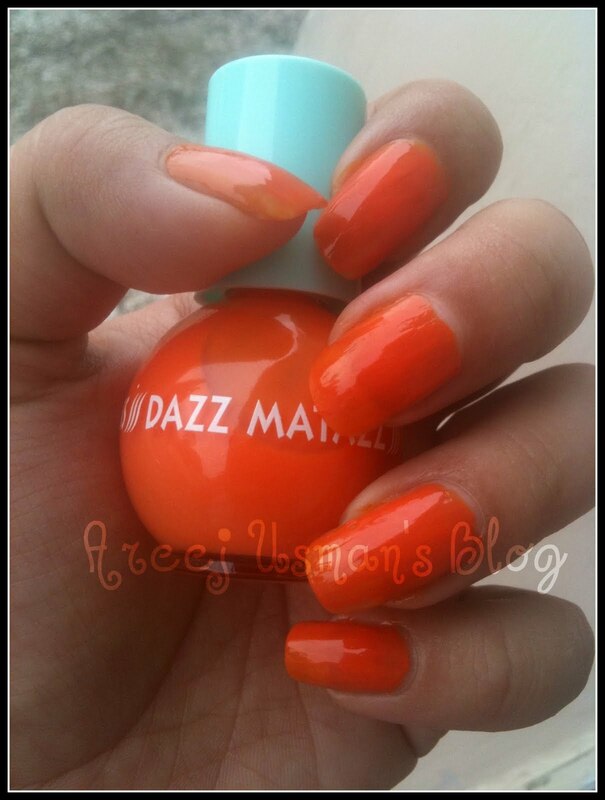 Now every woman can achieve salon perfect nails from the comfort of home with Dazz Matazz Nail Express , Toluene,DBP & Camphor free formula. 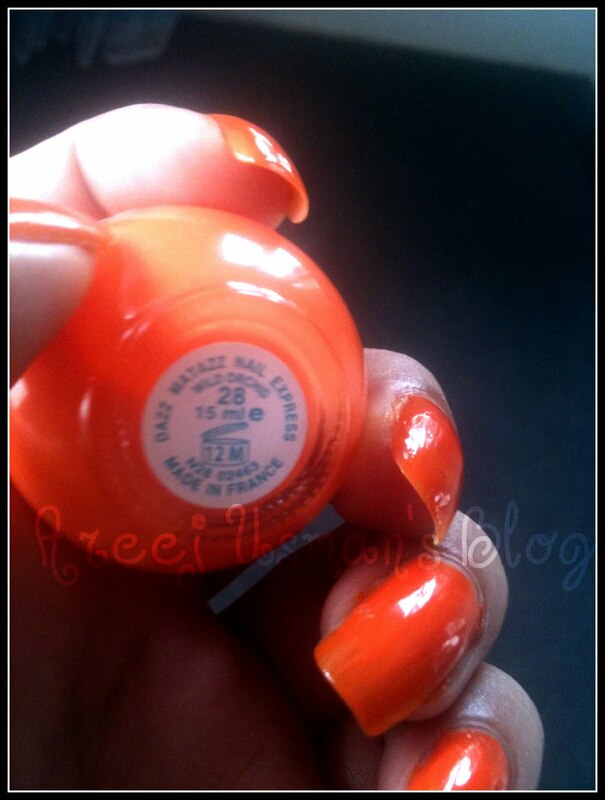 As all of you girls know this summer was & still is about neon & bright shades so I always had an eye open for such nail colors.I also came across 2,3 orange shades by different brands but unluckily they didnt catch my attention much.Some would be a dull orange some would be too bright for my skin tone.But as soon as I came across this one I knew it was THE Orange for me! What do you say girls isnt it pretty! I have applied two coats of the nail color.I havent applied a top coat on top because it was getting messier with the top coat.Dont try to touch the nails to check if they are dry or not.If you do your nail would have your finger print on it!After one coat is completely dry apply the second & let it dry too. Here are some more pix of the nail color. I bought this for PRS.200/- from Hayee’s Jinnah Super. Comments & questions are always welcomed. Sara & Jeeya Thanks for correcting me.I looked for the info on the site but cudnt find it & this had a MADE IN FRANCE tag so I thought likewise!